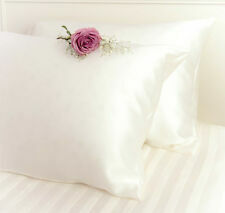 LUXURIOUS 100% PURE SILK PILLOW CASE 1PC IVORY CHAMPAGNE UK STANDARD-STUNNING!! Feeling Pampereds silk pillowcase. They love the quality and services. With Back overlap envelope closure. Or you can just love it for its beauty and comfort. Prevents bed hair and breakage of hair. Wake refreshed. Organic Premium Grade Mulberry Silk. Premium Grade Quality long strand pure Organic silk. "Natural IVORY White. 4 piece 19.5m Ivory White. Wake up refreshed. Luxurious Siz Double bed Sheet Set. They are breathable, cool and smooth against your skin. They are naturally hypoallergenic. They also prevent dry or frizzy hair, and will help to keep your hair style longer. It minimizes hair tangles and breakage. Feeling Pampereds silk pillowcase. In an elegant champagne color, very alluring and beautiful. Or you can just love it for its beauty and comfort. Prevents bed hair and breakage of hair. With Back overlap envelope closure. Wake refreshed. Premium Grade Quality long strand pure Organic silk. Organic Premium Grade Mulberry Silk. Wake up refreshed. 1 Pure Silk Top Flat Sheet. 1 Pure Silk Well Fitted Sheet. 4 piece 19.5m Ivory White. Enjoy Feeling Pampered and let sweet dreams descend. Feeling Pampereds silk pillowcase. Or you can just love it for its beauty and comfort. Prevents bed hair and breakage of hair. In a soothing neutral pink color, very alluring and beautiful. Organic Premium Grade Mulberry Silk. "Rich Golden Coffee". ALL OVER- luxurious 19mm Lush, "Rich Golden Coffee". Premium Grade Quality long strand pure Organic silk. Pure Organic Silk. 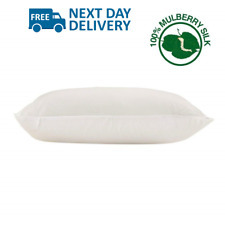 1 x Pure Silk Pillow-cases. (You can't find this in your local Bed, Bath and Beyond or Macy's) at a great price to you. In Luscious jet black color. Natural silk are hypo allergenic easily goes with your exisiting bed colors. Machine washable-delicate cycle in cold water, air dry, cool iron and no bleach or you can dry clean it. (Includes two King size silk pillowcases, one flat sheet and one fitted sheet. You can't find this in your local Bed, Bath and Beyond or Macy's) at a great price to you. Feeling Pampered's silk. Enjoy Feeling Pampered and let sweet dreams descend. (Includes two King size silk pillowcase, one California king fitted sheet (72x84" and can fit up to 17" deep mattress) and one flat sheet. You can't find this in your local Bed, Bath and Beyond or Macy's) at a great price to you. (Includes two queen size silk pillowcase, one fitted sheet and one flat sheet. You can't find this in your local Bed, Bath and Beyond or Macy's) at a great price to you. In Beautiful dark gray color, luxurious and sumptuous. (You can't find this in your local Bed, Bath and Beyond or Macy's) at a great price to you. Seamless with 15" pockets that accomodate mattresses up to 17" deep. In Natural soft Undye off white color, very alluring with a touch of twilight glow. (Includes two Queen size silk pillowcases, one flat sheet and one fitted sheet. You can't find this in your local Bed, Bath and Beyond or Macy's) at a great price to you. Feeling Pampered's silk. Enjoy Feeling Pampered and let sweet dreams descend. Magnificent NEW Color "Aubergine". 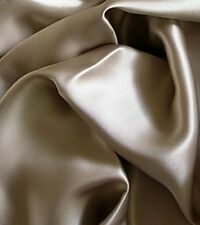 Beautifully Crafted from Extra Thick Lush 22.5mm Pure Silk. 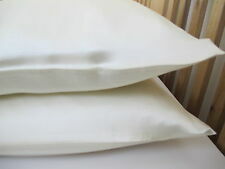 100% Pure Silk Bed Pillows One set of 2. Queen Bed Sheets available Also in; Glossy Silver/ Ivory Soft White / Pitch Black/ Deep Purple/Lotus Pink/Sky Blue. 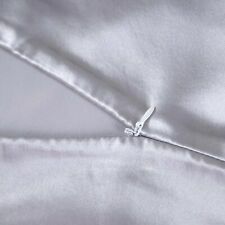 Long strand 100% Silk Bed Sheet KING size. King, Queen Double Size Bed Sheets available. Australian Standard size pillow- Large sizes ordered on request. Dye Batches Vary, for both economical, creative interest purposes Larger custom orders. (You can't find this in your local Bed, Bath and Beyond or Macy's) at a great price to you. In Beautiful silver gray color. Natural silk are hypo allergenic easily goes with your exisiting bed colors. (Includes two King size silk pillowcases, one flat sheet and one fitted sheet. You can't find this in your local Bed, Bath and Beyond or Macy's) at a great price to you. Fits California King size bed 72x84" and mattresses up to 17" in depth. (You can't find this in your local Bed, Bath and Beyond or Macy's) at a great price to you. In luscious Navy blue color. 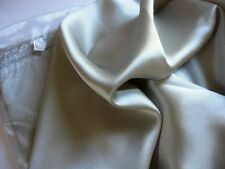 Natural silk are hypo allergenic and once your slept on silk, you will not go back to cotton. Luxurious 100% silk charmeuse Fitted Bottom sheet Full size Dark Gray 56x76"
(Size 56x76", fits Full size bed and mattresses up to 17" deep. You can't find this in your local Bed, Bath and Beyond or Macy's) at a great price to you. In Luscious dark gray color. Natural silk are hypo allergenic easily goes with your exisiting bed colors. (You can't find this in your local Bed, Bath and Beyond or Macy's) at a great price to you. In beautiful champagne color. Natural silk are hypo allergenic easily goes with your exisiting bed colors. Size 78x80 ", fits king size bed and up to 17" deep mattress. (Fits Twin Size mattress 39x76 and mattresses up to 17" deep (if you are looking for Twin XL, we have them as well). You can't find this in your local Bed, Bath and Beyond or Macy's) at a great price to you. Tranquility with New Fantastic. Wake refreshed. Premium Grade Quality long strand pure Organic silk. Organic Premium Grade Mulberry Silk. Wake up refreshed. 1 Pure Silk Top Flat Sheet. 1 Pure Silk Well Fitted Sheet. (Includes two King size silk pillowcases, one King flat sheet and Two Twin XL fitted sheet (39X80"). You can't find this in your local Bed, Bath and Beyond or Macy's) at a great price to you. Natural silk are hypo allergenic easily goes with your exisiting bed colors. (Enjoy Feeling Pampered and let sweet dreams descend. They love the quality and services. You can't find this in your local Bed, Bath and Beyond or Macy's) at a great price to you and in many different color selections. Thick lush 4 piece Sheet Set. Note;The 100% pure natural silkworm silk Pillow Case in 'Silver' has a very glossy Satin-like high shine, very pale grey pure silk, which gives this beautiful pillow case its superb 'Silver appearance'. They love the quality and services. With Back overlap envelope closure. Or you can just love it for its beauty and comfort. Prevents bed hair and breakage of hair. Machine washable-delicate cycle in cold water, air dry, cool iron and no bleach or you can dry clean it. (Twin Size 70x108. You can't find this in your local Bed, Bath and Beyond or Macy's) at a great price to you. Feeling Pampered's silk. Machine washable-delicate cycle in cold water, air dry, cool iron and no bleach or you can dry clean it. Wake refreshed. Premium Grade Quality long strand pure Organic silk. Organic Premium Grade Mulberry Silk. 1 Pure Silk Top Flat Sheet. Wake up refreshed. 1 Pure Silk Well Fitted Sheet. 4 piece 19.5m Ivory White. Wake refreshed. Organic Premium Grade Mulberry Silk. Premium Grade Quality long strand pure Organic silk. Wake up refreshed. Luxurious Siz Double bed Sheet Set. 1 Pure Silk Top Flat Sheet. 1 Pure Silk Well Fitted Sheet. Superb Calm Soft Forest Green& Luxuriously Glossy. Note;The 100% pure natural silkworm silk Pillow Case in 'Silver' has a very glossy Satin-like high shine, very pale grey pure silk, which gives this beautiful pillow case its superb 'Silver appearance'. (Includes two queen size silk pillowcase, one fitted sheet and one flat sheet. You can't find this in your local Bed, Bath and Beyond or Macy's) at a great price to you. Feeling Pampered's silk. Machine washable-delicate cycle in cold water, air dry, cool iron and no bleach or you can dry clean it. The Starry Night Van Gogh Throw Pillow Cover Silk Hand Embroidered 18" x 18"